Me, my art, and the stuff that moves me. 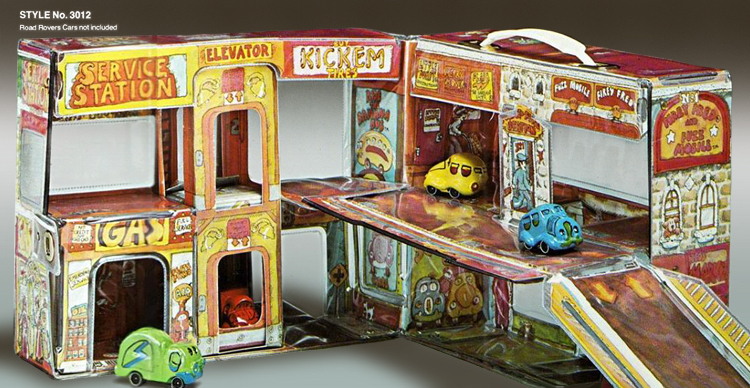 In 1974, Kansas City, Missouri-based greeting card giant HALLMARK licensed a line of die-cast metal cartoony-looking cars from LJN Toys in New York. 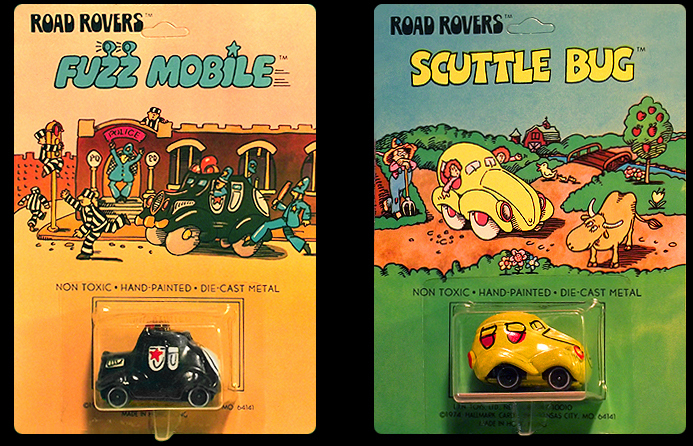 They called them ROAD ROVERS (link) and gave them all silly names like Scuttle Bug and Little Dumpy. They were cute, lumpy, brightly painted and one of my early memories of childhood fun. I did not own any at the time, but played with my next door neighbor who had some. I remember them being kinda cold and heavy. And they sorta looked like they were made of Play-Doh. Initially 10 cars were produced in a limited run. They were made in Hong Kong and individually hand-painted, so each one was slightly unique. They were packaged on individual blister cards with really cool 1970's style art (current for it's time). It's kind of a mix of The Adventures of Letterman cartoons from original The Electric Company series and Heinz Edlemann's designs for The Beatles Yellow Submarine animated film. The artwork was so cheerful and appealing I wanted to shrink myself down and run around in the little Road Rover's world. Well instead, I just played with them in mine. The art was the work of the amazingly talented Robert Blair Martin (usually signed "Bob" Martin) who was a freelance artist for Hallmark in the 1970s, and later joined them in the role of "senior illustrator" in the 1980s dispite him being only in his thirties. He is well known for his line of intricately illustrated Springbok jigsaw puzzles featuring elaborately busy Richard Scary-esque scenes. 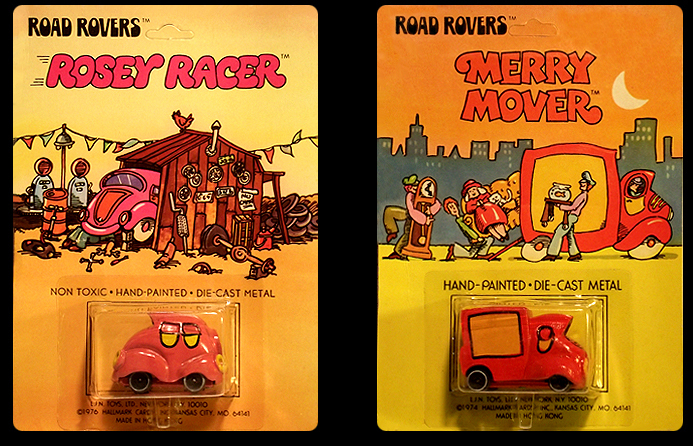 Now what's interesting to collectors today is that in the 1974 series, they introduced a pink and yellow car called Rosey Racer. 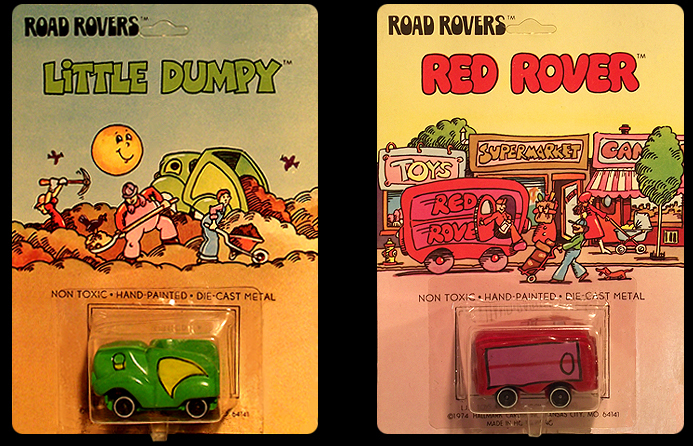 Perhaps because of it's feminine name and color scheme, the predominantly young male market was not that interested in Rosey and it sold poorly enough to get a face lift and a name change for the 1975 revamped line of Road Rovers. Of course today, little Rosey is the crown jewel of many a collection due to it's rarity. 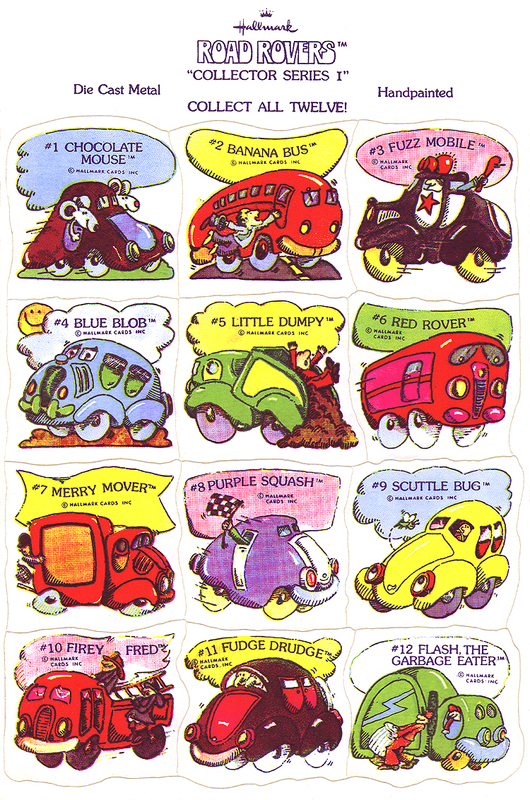 Here's all 10 of the original '74 line-up featuring: Fuzz Mobile, Scuttle Bug, Flash the Garbage Eater, Banana Bus, Blue Blob, Firey Fred, Little Dumpy, Red Rover, Rosey Racer, and Merry Mover. 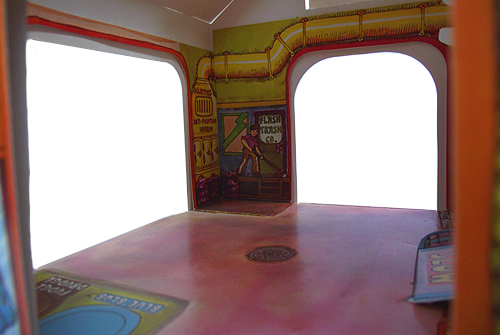 Inexplicable minutia: Scuttle Bug, Banana Bus and Bue Blob have white cardboard floors inside their clear bubble. 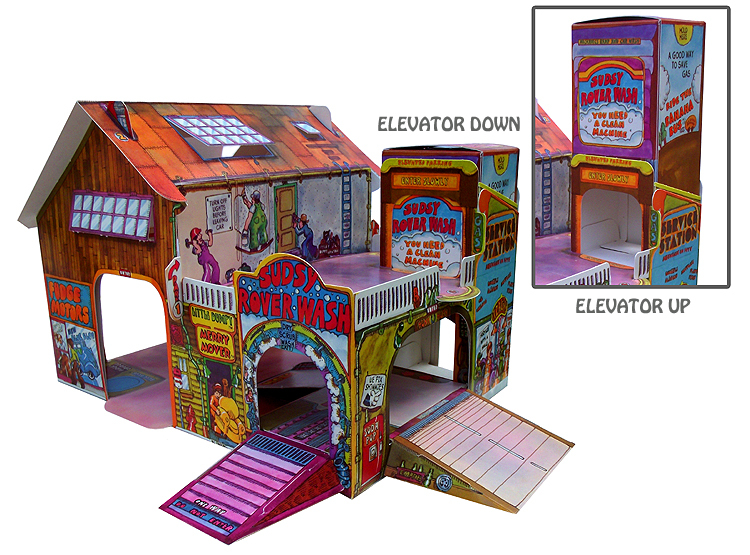 And Merry Mover does not have "NON TOXIC" written on the package (and it also features a different font). 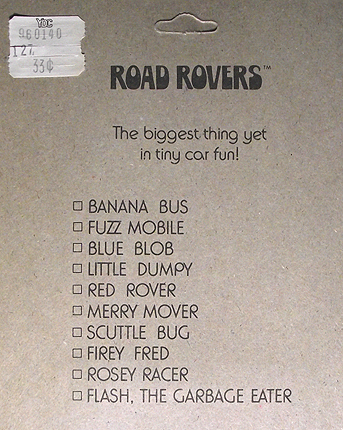 The reverse side features a complete checklist of all 10 cars available at that time and the slogan "The Biggest Thing Yet in Tiny Car Fun!". 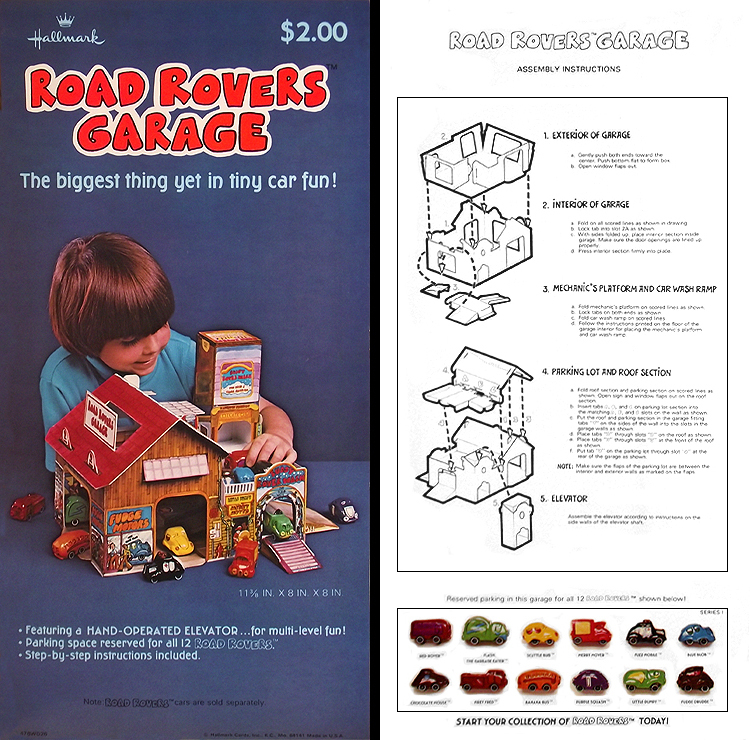 Note: Although I've found no evidence that the product shown below actually shipped to stores, a 1976 LJN Toys Catalog features a photo of a Road Rovers Vinyl Garage. 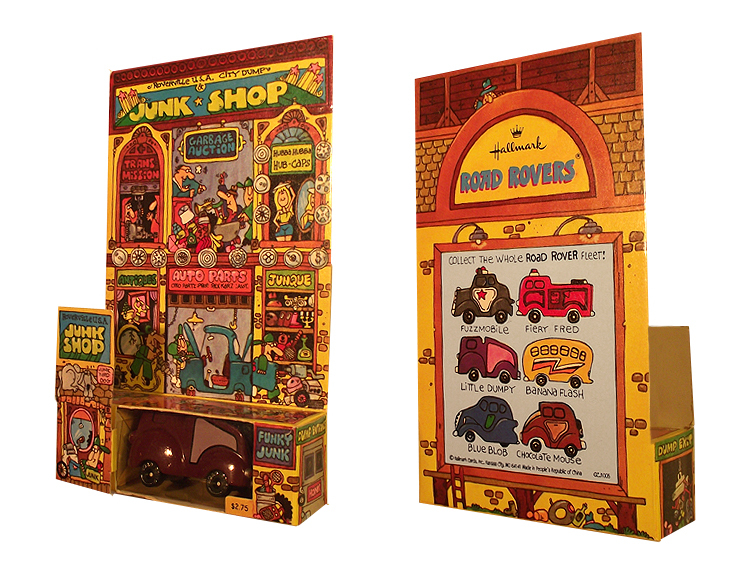 This carrying case-style vinyl playset is similar in overall construction to LJN's other sets produced for their mid-seventies TV properties such as EMERGENCY! and S.W.A.T. It's most likely that the photo is of a prototype and was never mass-produced. Perhaps the less expensive all-paper version shown above was seen as a more economic, and quite honestly better looking, alternative and therefore the vinyl version never made it out of the catalog. 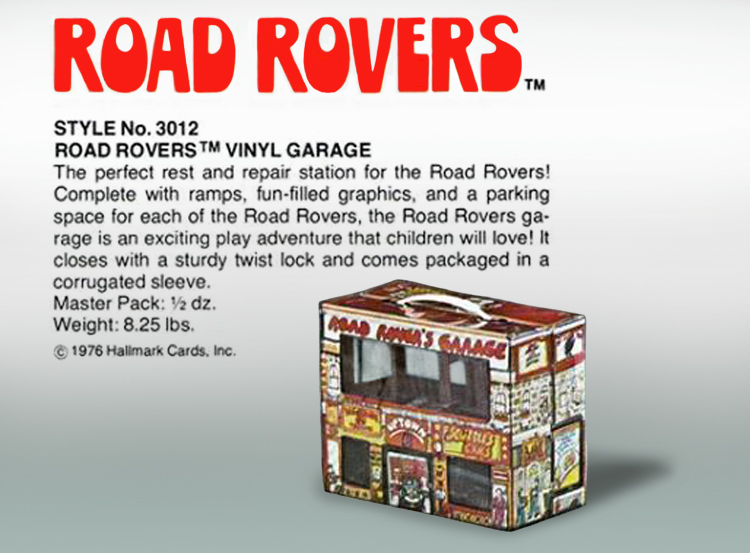 Until evidence surfaces to prove otherwise, the "vinyl garage" remains a curious oddity in Road Rovers toy history. Then, in 1976 something unexpected happened. At that time, Wallace Berrie Co. was a maker of cheap toys and novelty items. (They would go on to great success six years later with a line of Smurf figurines.) 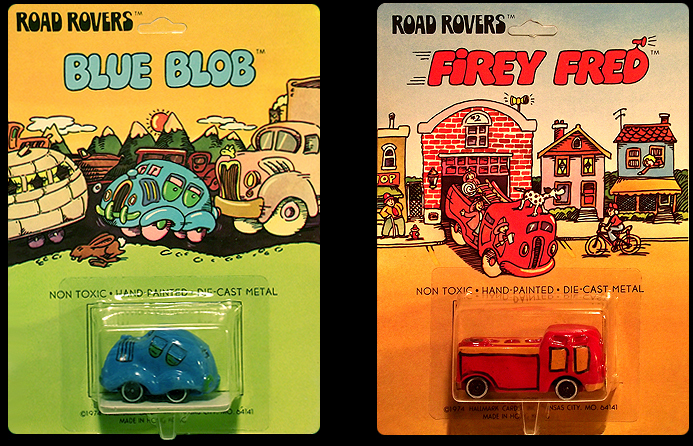 Well, someone over at WB must've been a big fan of the little Rovers, as they decided to do a knock-off line of VERY similar little vehicles. 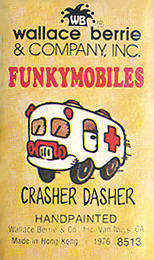 They called theirs... FUNKYMOBILES (link). 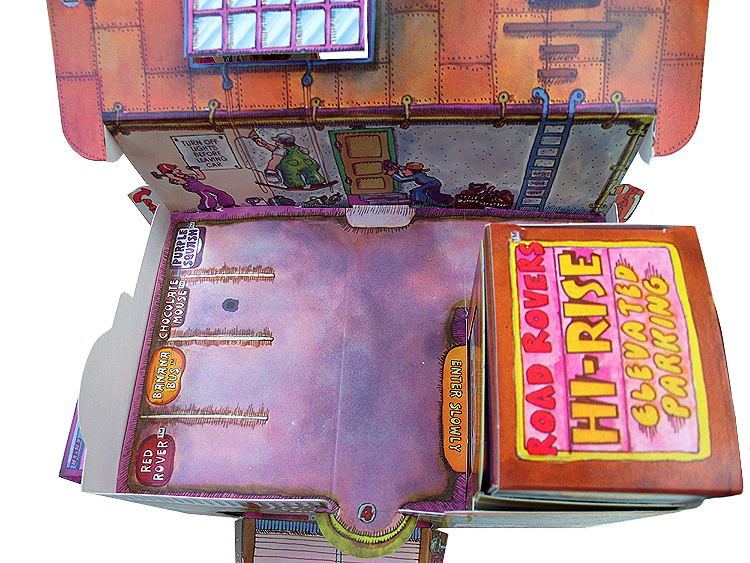 Here's a comparison of the art on the inside of the Road Rover Firey Fred box and the Funkymobile Flamer Tamer box. Notice the similarities: helmets hanging on wall, boots paired up on the floor, one man on pole, one man putting on his boots, even two windows with drawstring blinds. There was some variation in the Funkies during the production run. They were hand painted so each vehicle had unique details, but their were some slight fluctuations in overall base color, such as the shade of purple on Gallopin' Grape. 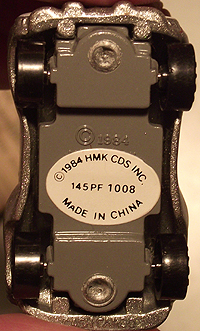 There was a production run of the vehicles produced in Hong Kong, and another run from Taiwan. Perhaps for this reason some cars were produced without the white painted rim on the tires. It was just left black. (Most, if not all, vehicles were available with and without white rims. This variation does not affect the collector value of the car.) And apparently a small number of the Copper Boppers had a light blue star on the door instead of the more common red star. In 1983 someone at Hallmark had the bright idea of bringing the ROAD ROVERS back! Six cars were chosen from the 1975 line-up. But instead of just re-releasing the exact same cars. Hallmark had them all re-designed to take advantage of new casting techniques. So the new versions had slightly more detail and a little less "lumpiness" (similar to the Funkymobiles). 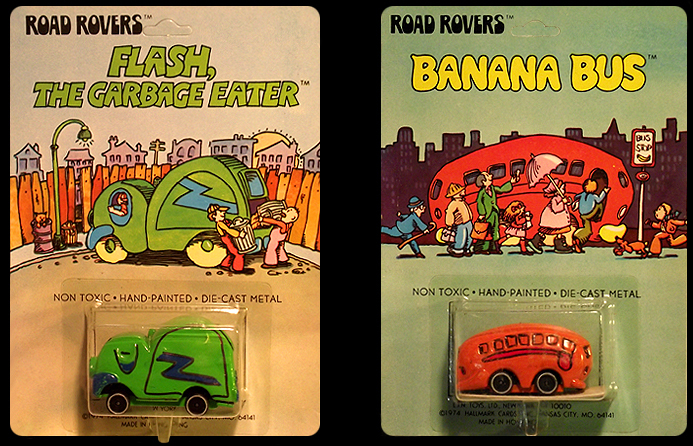 Also of note, Banana Bus (originally orange) was now actually painted yellow (appropriately) with a lightning bolt added down the side, and was released under the new name Banana Flash (perhaps a nod to Flash, the Garbage Eater, from where they borrowed the lightning bolt). Old Fudge Drudge was given a revamp like the others, but was released under the name Chocolate Mouse (although it's obviously NOT a redesign of the old Chocolate Mouse.) Little Dumpy, previously green, was now a dark plum. Another change, instead of white wall tires, they all had Road Rovers written in metallic silver on each tire. 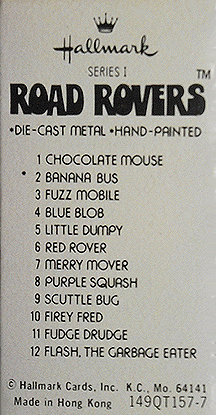 The next (and final) series of Road Rovers, released in 1984, consisted of six entirely new vehicles. These were slightly more cartoonish in nature. 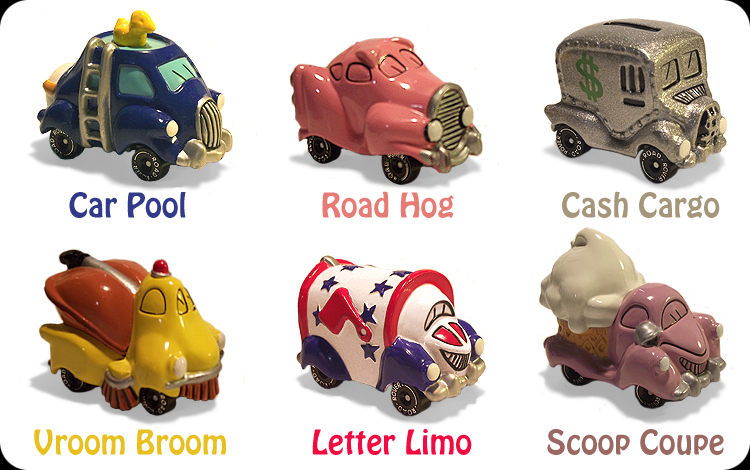 Instead of simply a lumpy-looking fire truck, Hallmark offered a pig on wheels and called it Road Hog, and a postal truck which looks like a mailbox (Letter Limo), a street sweeper which resembles a vacuum (Vroom Broom), etc. 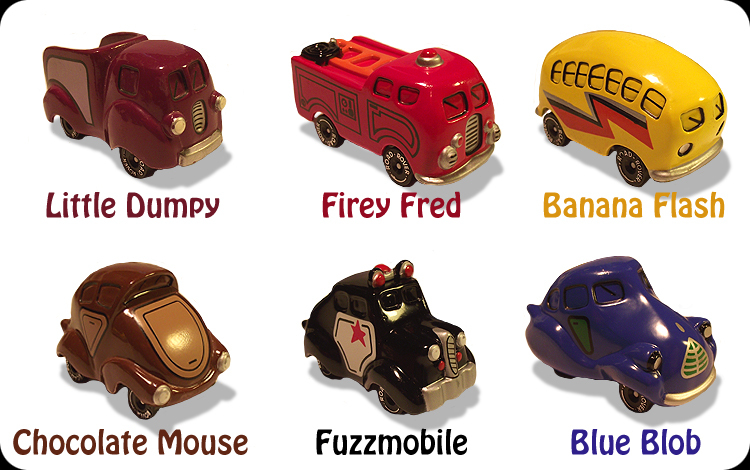 And, perhaps to save on production costs, Hallmark released these six cars with no packaging at all. Just an oval sticker on the bottom (as seen on the right). From day one, all Road Rovers had their name embossed on the bottom. (Although it's hard to see in the photo, it reads Cash Cargo on the bottom of the bumper here in raised letters.) Also the 1983 line were re-released in late 1984 with just the white oval stickers on the bottom and no other packaging. I don't think the 1980's line made as big of a splash with consumers and this, sadly, was the end of Road Rovers. 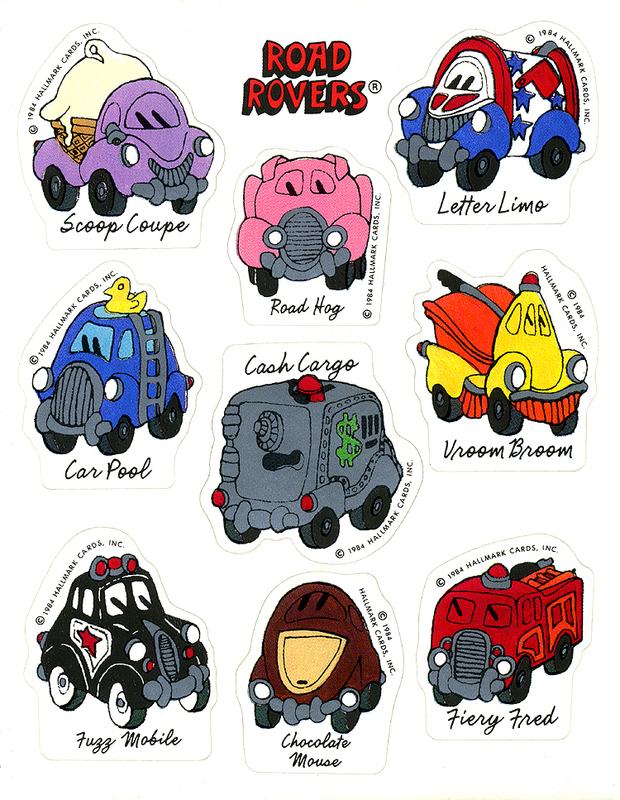 And again in 1984, another sticker sheet, featuring a mix of the '83 and '84 series. (Apparently they had no love for: Blue Blob, Little Dumpy and Banana Flash.) On this sticker sheet Fuzz Mobile went back to being written as two words. 2. 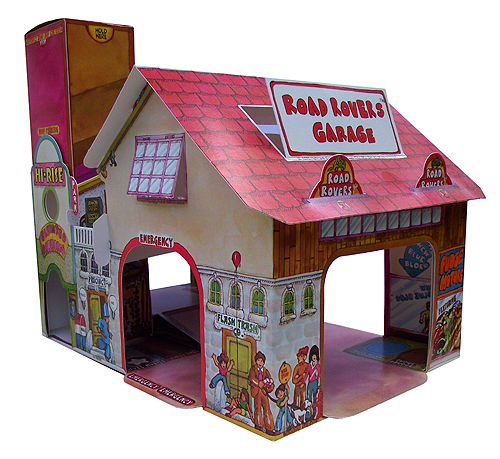 Six grand prize winners will receive a free Road Rovers garage. Many thanks to reader "Zipactonal" for contributing the above info an image. Due to interest I've now included a Market Value List (as of 2012). If you are a collector eBay.com is still one of your best bets for finding them. But they do turn up on other online auctions sites, and of course yard/garage/estate sales from time to time. Keep in mind these are only as valuable as the buyer's desire. You may get lucky and get a bargain, or you may be up against another collector heart-set on getting that last piece. 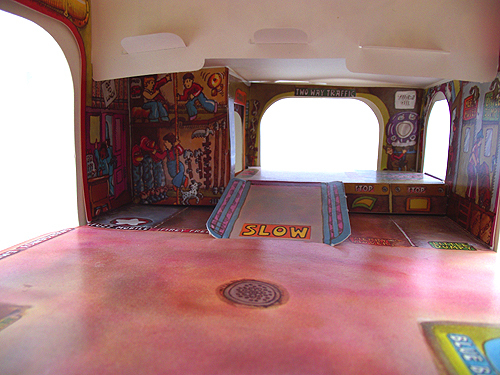 Rosey Racer has been known to fetch nearly $200 on rare occasions. All evaluations are in US Dollars. Here's a nice article with more information from the Collector's Club of Great Britain. So that's the history of the Hallmark Road Rovers and Wallace Berrie Funkymobiles. I'll update this post with new information or better images as they become available. Happy childhood memories! And please leave me a comment if you liked this post. ~ Thanks! Labels: 1970's, 1980's, darren wheeling, Funky Mobiles, Funkymobiles, Garage, Hallmark Cards, little fun toy cars, Road Rovers, Rosey Racer, Vintage Toys, Wallace Berrie Co.
i was just at a yard sale and picked up a 1983 banana flash and a 1984 vroom broom, loose... theres some paint chip-age on both but the vroom broom is in pretty nice shape. if ur interested in them let me know. 724-496-9432 my name is Bill. and thank you for making sucha detailed website. it really helped. Thanks Bill. Glad you found this page informative. Sorry but I already have the ones you've mentioned but I bet they would sell to someone on eBay for the right price. Remember Vroom Broom did not have any packaging so "loose" is all there is for that one. If it has the white round sticker on the bottom that may add some slight value. But it's condition is more important. Good luck! Thanks for putting together some great information about the Road Rovers. As a child I only had the stickers. I had a lot of them at one point. Now I think I would like to start buying the actual cars. I am torn between getting the 1974 series or the 1975 series. Glad you found this information useful. The 1975 series is much easier to find, and less expensive usually. 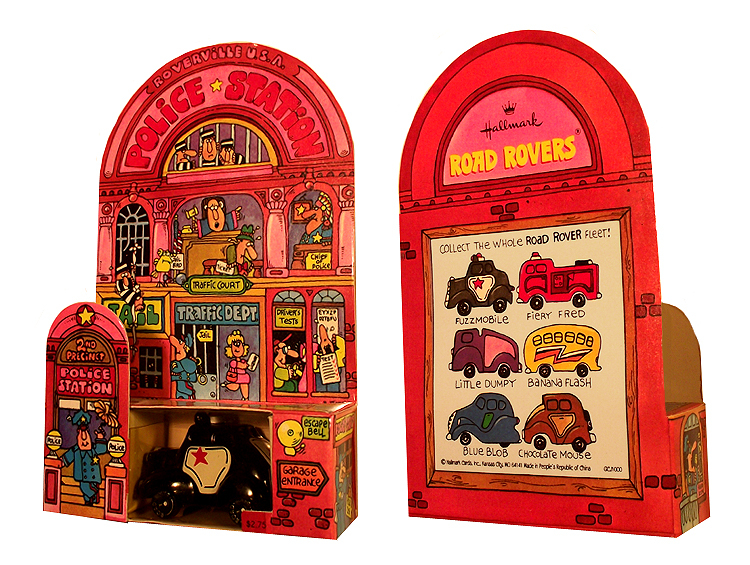 Someone is selling the entire 1975 series on ebay right now: http://www.ebay.com/itm/Hallmark-Road-Rovers-Series-1-1975-Complete-Set-in-original-Boxes-SUPER-/271063487173?pt=LH_DefaultDomain_0&hash=item3f1ca492c5 . They look to be in near-mint condition. Their asking price is pretty steep though. Perhaps make them a more reasonable offer. Good luck! My Word, what a great site you have here! I really enjoyed reading about the history and love the photos you've included. Truly wonderful! Thanks for your detail and posting for all of us to enjoy! You're quite welcome. I'm glad you found it interesting. David, The prices are listed above. But you might get more for the lot if you sell them individually. Usually as a set they go for around $100-$125. But if a collector only needs one or two to complete his collection then he might not bid on the whole lot. But on eBay you never know who will see your auction or how "hungry" they are for what you have. I've posted items that went unsold, only to be re-posted later and then a bidding war started over my item. And if you auction them one by one you can sometimes gauge how they are selling and price the remaining items accordingly. Good luck! does MIB mean in tact? Great info - thanks for pulling everything together! 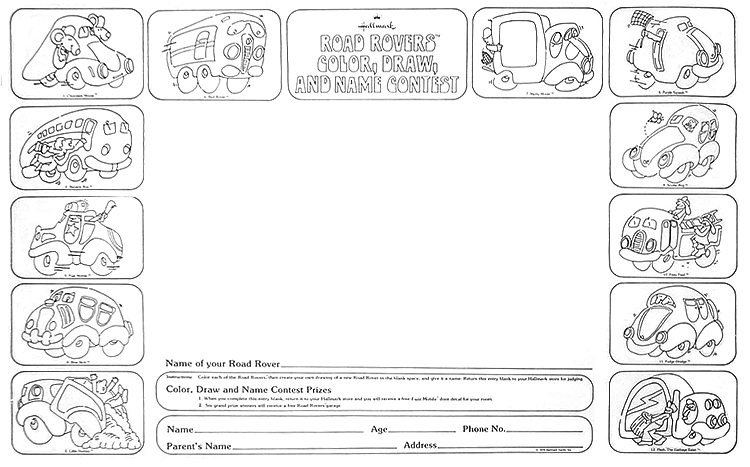 I have an old Hallmark 'Color, Draw and Name' contest form. It has a 1975 copyright date. 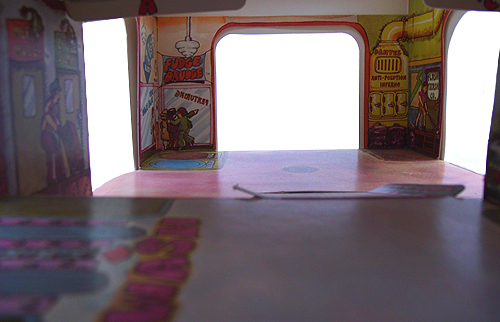 It's about the size of a placemat and has outlines of each of the 2nd series Road Rovers at the perimeter (no Rosey). There's a big blank area in the middle where you can design your very own RR. ** It's too big to scan 12" x 17" but I'll take a photo if you'd like. That sounds neat. I would've totally done that as a kid. If you can kindly photograph it I can add it to the post above. Thanks for the info. Thanks! I've now incorporated your info into the blog above. Much appreciated! Great posting with lots of pictures! Question: What is the serial # for Garbage Guzzler and Maxi the Taxi? One would be # 8518 and the other # 8521. I've updated the Funky Mobile checklist with known model numbers. Your numbers sound about right to me. But I can't verify. And yep I know about the recent Pupil Packer auction. That's where I snagged the image for it above. They don't show up very often. When you have two determined bidders you get a real feeding frenzy. It's nice to see that the FB and RR collector's market is still vibrant and very much alive. Anything else you can contribute is much appreciated. Thanks Again. The model numbers are interesting because I've found 8505 through 8516 are much more common than 8517 through 8524 (your price estimates reflect this). I wonder what the distribution was for each group. 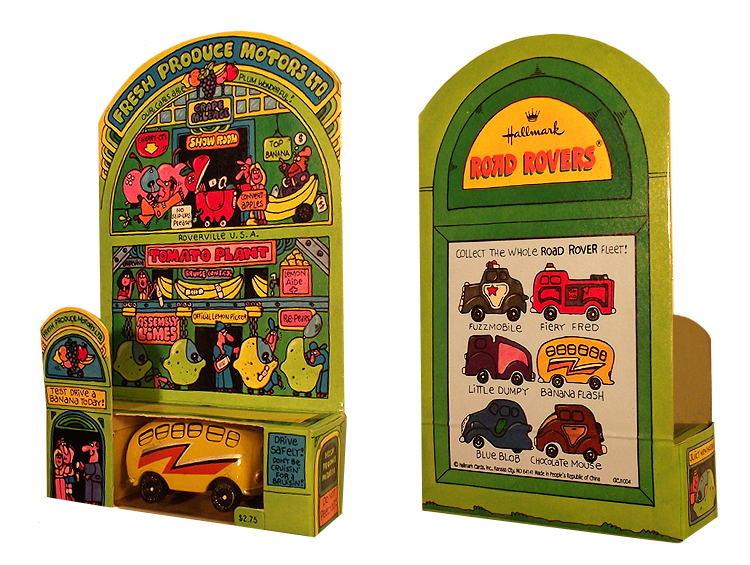 Razzamagas actually has a date of "1977" on the bottom of the packaging box, although the bottom of the actual car has "© 76" embossed. 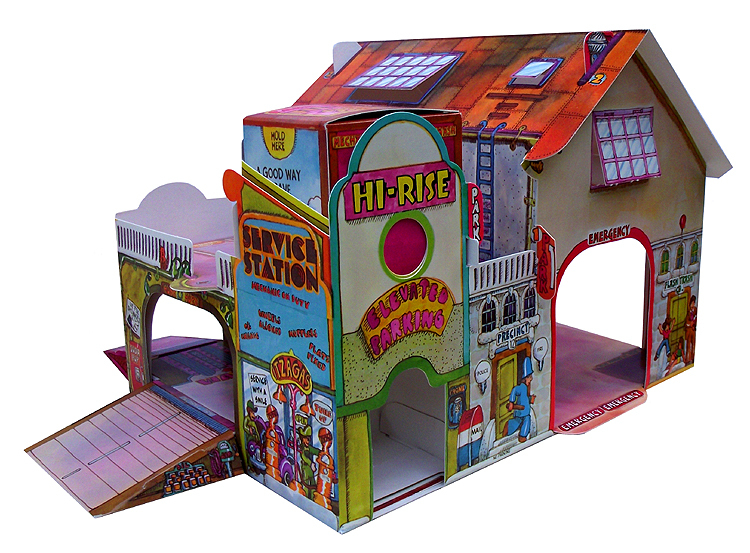 I had a set and the garage as a kid. Not sure where's they ended up. Really appreciate your website and all the detail. Thanks! I'm trying to make this information as complete as possible. Check back as I update this page whenever I get new info. I bought the garage off of eBay, and I have since put together a set made up of some from '74 and '75. Now if I can just get the space to set it up on the bookshelf! Wish Me Luck! Again, I cannot thank you enough for your site! Do you happen to have any boxes for sale? Sorry no. You might try eBay or other auction services. Good luck. Hello Darren...I recently bought a HoodMobile from a local diecast collector based upon its funkiness and uniqueness. I had no idea of the history behind it, nor of the other available vehicles. Thank you for providing such a wealth of information. I'm glad you found this blog valuable. Now you've got some work to do if you want a complete collection. Happy collecting! I have found a Haulin' Harry MIB. You have it listed as $20, but i have noticed this same item going for between $35-$60 without a box on ebay and amazon. Any idea how to get a more accurate price? A single item can be driven up by just 2 collectors willing to pay "above average" price for something to complete their collection. I've been guilty of that as well. A seller can ask for whatever they want. I've seen a beat-up Rosey Racer on the auction block for over $300, far above it's value. It doesn't mean it's now worth that. I stick by my price guide as an averaged fair market rate. But you, as a collector, are the only one to know it's true value to you. Happy hunting. Well, I mentioned above in the price guide that you could honestly sell Rosey Racer for about $65 open in good condition. Perhaps $95 or so still in the box (or maybe WITH the box) to the right buyer. Of course sellers are asking hundeds on ebay but you can ASK anything you want. But the second hand collector market seems to still support my averaged values listed above these comments. If you list it at $65 the auction market will push it higher if you can find two buyers willing to go higher. Good luck! It certainly could. The market value for second hand items is always fluctuating, like the stock market, so always check "completed auctions" (in the "advanced search" section) on sites such as eBay to view the most recent price ranges. Thanks for the information! My husband and I have a small collection of these cars, which we display among HO trains, etc. 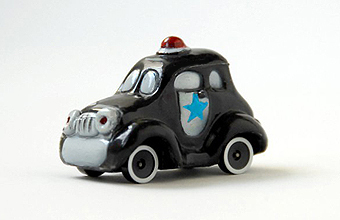 and have been searching for information about these funny little cars! This is the most, and best information we have run across. Keep up the great work! They're cute. I like the bright yellow one and the chocolate one. It's interesting how sometimes the toys of youth become more valuable as time goes by. They mean a lot to people and so they become more valuable to those who are now adults. It's quite an interesting collection of photos you have there. It's great to see this on the web. I was one of those kids who won a grand prize. My picture in the middle was of a white van with a big pink rose on the side. 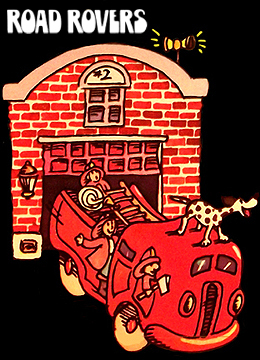 I loved playing with those cars. Unfortunately, I have no idea where they ended up. Wow that's cool that you won. AND still remember what you drew. Yep, it's surprising what information you can find on the web. Thanks for your story. It's great you can pass them down to the next generation and they can appreciate them too. They are simple toys, but obviously designed with much care. Sorry Norman, I don't have any additional info regarding the production of the Road Rovers. The rivet assembly may have differed simply due to the design of car itself. I know of no Rovers that CHANGED from 1 rivet to 2 during the production runs. Some always had 1 (usually the smaller cars) and others always had 2. It was probably only out of necessity that the second rivet was added. I'll add more info if I find any. - Thanks! Interesting. Good to know. Thanks! Thank you for your detailed post! I had been trying to remember all the details of these little cars I purchased back in the 70's. I couldn't find anyone that remembered they even existed and I have no idea what happened to the ones I had purchased. It was nice to look through the post and re-live that little piece of childhood that has never left my memory for 40 years! Thanks again! Glad I could help drive you down Memory Lane. Just remember to make the first right turn after Nostalgia Boulevard. And. Drive. Slow. Awesome! Congrats on winning the Garage! Did you take a photo of you posing with your art before sending it in? Thank you so much for this informative page, Darren! Earlier this evening, I happened to be digging through my garage, and found the Scuttle Bug I have owned since I was a child. It's possible I had additional Road Rovers, but I'm not certain. What I did remember from my childhood, though, was that I had always assumed these toys were made in South or Central America, because they looked so much like Mexican folk art, and because my parents bought them for me at a hippie store that carried a lot of toys and gifts from such countries. It was only tonight that I looked at the bottom of my Scuttle Bug, learned its name and manufacturer, got on Google, and wound up here, where I learned the true origin of these treasures. Interestingly, the copyright date stamped on the bottom of mine says 1977. That's interesting. 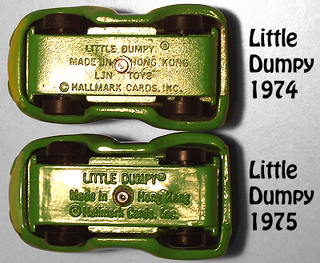 Perhaps Hallmark produced the cars through 1977 and updated the date stamp to reflect that. I don't suppose you still have the box packaging to see if the date on that was also 1977. Sadly, no, the packaging is long gone. In fact, I never had any recollection at all of the toy coming in a package. Thank you for this post, Darren!!! Thank you for the great info. I didn't know about these cars. I now see it is rare. The wheels are a little rotted away. But cleaned up nice and most of the paint is still there. And other than the wheels, no real damage. Looks like it was in the ground for a long time. Again, thank you for the great site and all the info. I now know about these great little cars. Glad you found the above info helpful and entertaining. That's pretty rare to dig one up! Probably a kid was playing with it in the dirt and got called home to dinner and there it rested, forgotten and lost for 40 years. Slowing sinking into the earth, back to Mother Nature and then you happen to come along and give Rosey a new life. If only toys could talk. Keep it as a souvenir. Sounds like you've got some rare Funkymobiles. eBay is your best bet to sell them at market price. Or hold on to them and enjoy them if you don't the extra cash. Thanks for the comment. What a great job you've done documenting all this and presenting it so well. Thank you very much for sharing this with us! Your information organizes and illuminates what would otherwise be only scattered scraps of memory. Back in 1975 I entered the Road Rovers drawing contest at our local Hallmark store. I was lucky enough to win the Road Rovers Garage prize with my drawing of "Hoverin' Herbie," a cartoon yellow VW beetle with helicopter rotors on top. He was obviously inspired by a 1974 Disney movie I had seen called "Herbie Rides Again," but I thought he fit in well with the Road Rovers world. It's great to see the entry form again here on your page! They displayed my drawing in the Hallmark store window for a month, which felt like a big deal to me as a little kid. 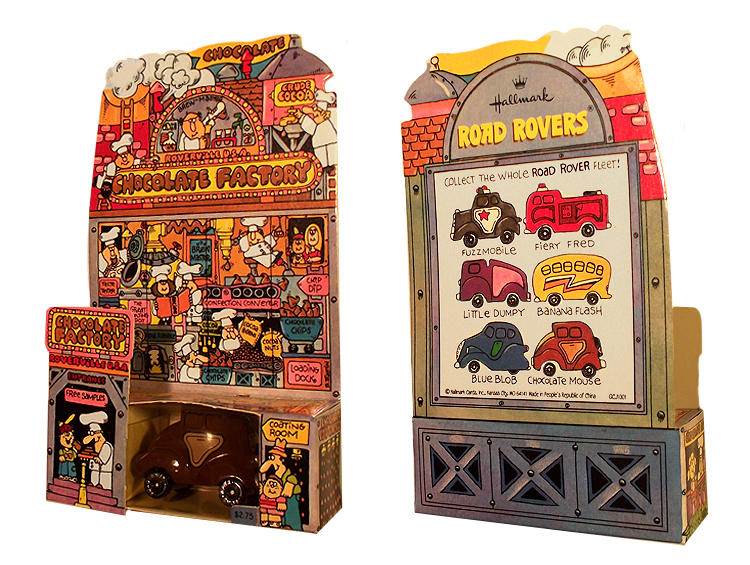 The Road Rovers Garage playset just delighted me and I marveled at how richly-conceived it was—practically a miniature city, with stores and a police station and endless interesting imagery and visual texture to pore over. 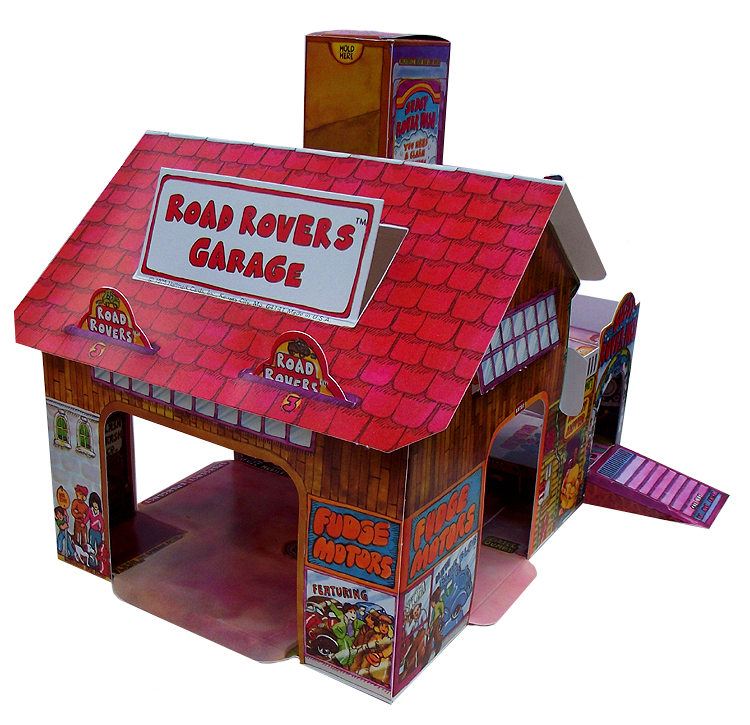 The Road Rovers Garage was packed with play value. I loved that thing and regretfully lost it only when we had to move house. It is a real pleasure to see it here again on your page. The pieces were daunting when I opened the package, but the construction was so well designed that even I had no trouble putting it together. 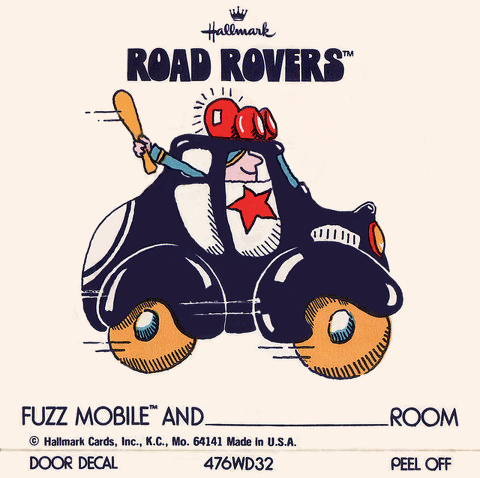 I owned only a few Road Rovers (Banana Bus, Little Dumpy, and Fudge Drudge) and mostly used the Garage with my Hot Wheels and Sizzlers, but I felt just as you did, that the Road Rovers artwork was so appealing and cheerful that I wanted to live in its world. Thanks so much for your kind comments and sharing your stroll down Memory Lane with others. 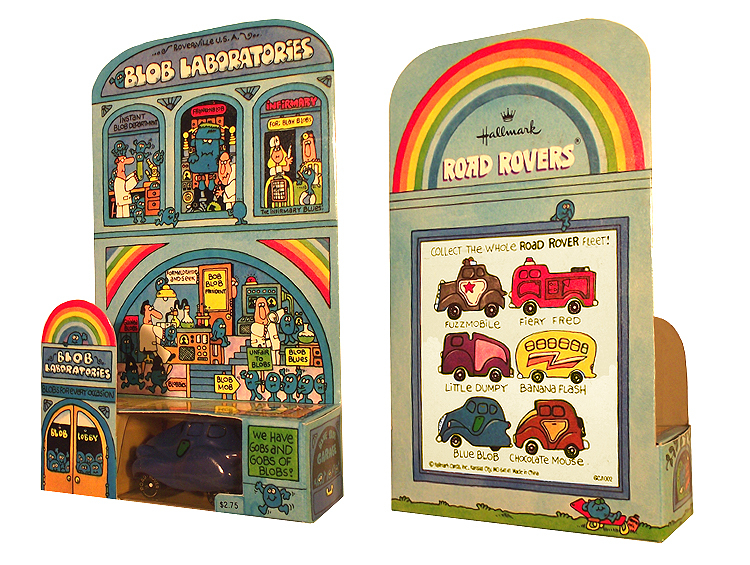 As you may know the artist who did the GARAGE and ROAD ROVERS PACKAGING ART was Robert Blair Martin. 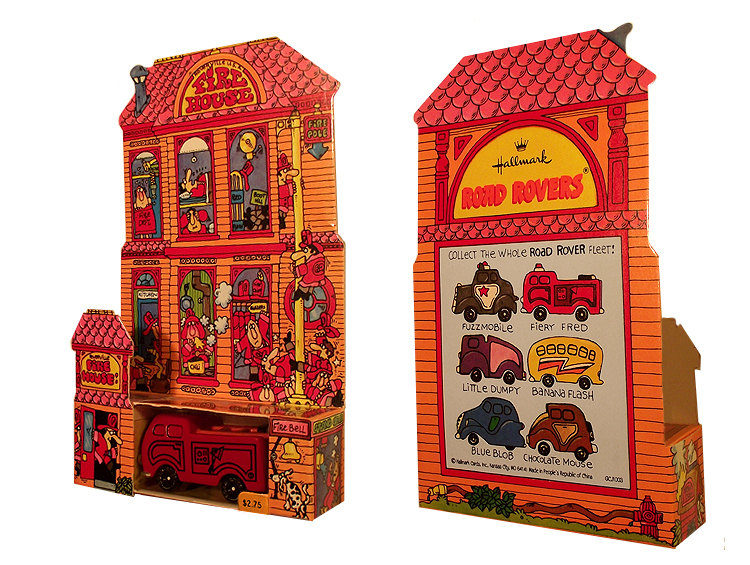 If you are interested in seeing more of his iconic 1970s fantasy world, his jijsaw puzzles are still widely available on the secondary market. 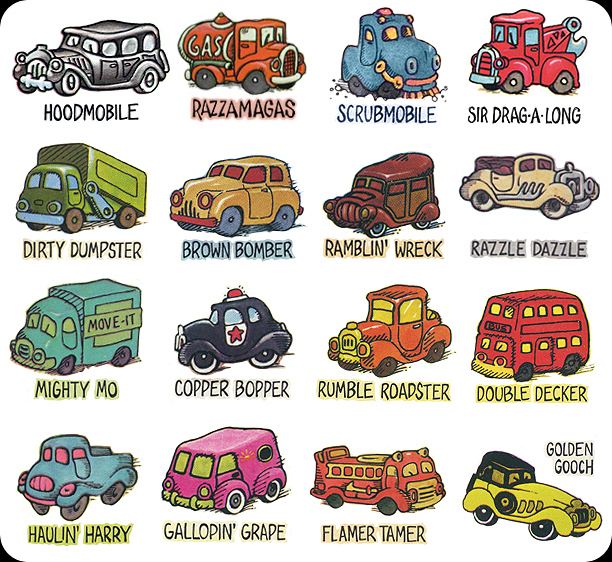 Some of them almost look like extensions of the ROAD ROVERS UNIVERSE. Check 'em out. I have a feeling you'll recognize his style right when you see it. Thanks again and have a great day. Did you know Mary doodles? Who's that woman in the dunes?